In the four years of running a foster home, my husband and I have tried several different housing arrangements for both foster rabbits and our own. We’ve finally come to the conclusion that, by far, portable wire exercise pens are the most versatile, the easiest to clean, and the best way to bring out the most desirable qualities in a rabbit. For those who want a quick housing solution without spending a lot of time and money, the wire pen arrangement gives you the most bang for your buck and your time. In my experience of housing more than 80 rabbits over the years, I have seen a marked difference in a rabbit’s attitude and behavior when he goes from being caged several hours a day to having an entire penned-in area as his own home base. After all, wouldn’t you want a bigger house rather than a small house, if you didn’t have to clean it yourself? I’ve noticed that the larger the space that the rabbit can claim as her own, the less territorial she becomes. Occasionally I get calls from shelters and other rabbit owners who tell me a rabbit nipped them when they stuck their hands into the cage, or when trying to refill food/water bowls, clean litterboxes, and so forth. In most cases, once a rabbit graduates to an exercise pen, this territorial aggression disappears. For some rabbits, there may still be some grunting when food bowls are rearranged, but the degree of territoriality is not nearly what it was when the rabbit was caged. Exercise pens also allow for the bunny to see what is going on around her. This gives her a feeling of knowing what’s happening and of being included in the household activities. The bunnies in my foster home immediately get up from their naps or relaxed positions to watch me do laundry or other chores. They love to watch the activity. My husband and I started off on the pen idea by first building rectangular pens out of recycled plywood. Wall heights were adjusted according to the ability of each rabbit to jump over a wall. The pens averaged roughly 4’ x 4’, or 16 square feet. The plywood walls, however, had several disadvantages. They were somewhat inflexible in size and shape, they required some light carpentry skills, and they soak up urine rapidly, rotting the wood over time. Also, they don’t allow the bunny to see much of what’s going on outside of the pen. clips that come with the panels. Note: the wire slats of the pen must be close enough together so that a tiny rabbit cannot walk through! When not in use, the panels fold up like an accordion and can be easily stored in a closet. They can also be easily transported by car to another location. For a larger space, many people choose a corner of a room, using the two corner walls as walls of the pen. This makes an even bigger space for the rabbit, since you have all eight panels to complete just two sides of the pen. They can be secured to the wall using the large clips and eye hooks, which can be purchased at any hardware store. 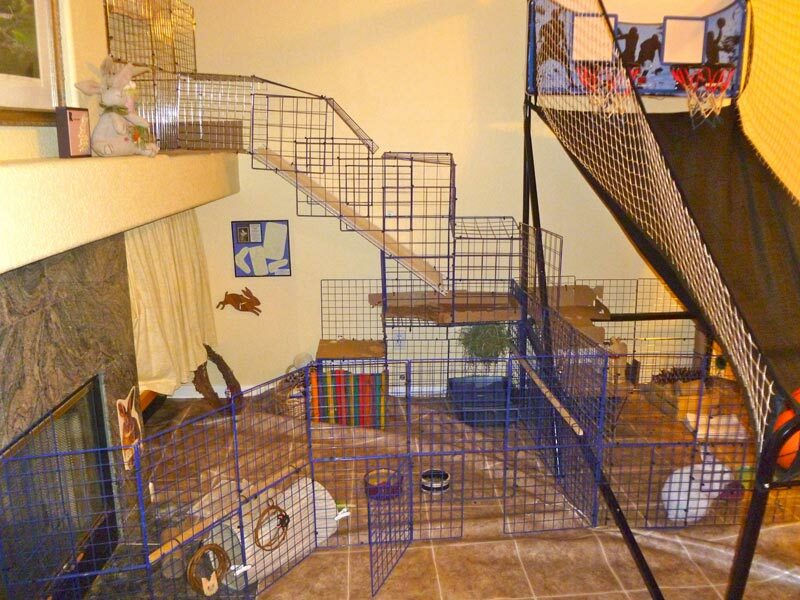 Exercise pens are a good solution for blocking off areas in your home where you don’t want bunny to go. To make the pen area smaller, overlap two or three panels and clip together. There is no need to take the panels apart. Need a bigger pen? Buy two and overlap panels as necessary. Is your bunny a jumper? Do you want to keep the cats out? Make a “lid” for the top by placing two 48-inch high panels horizontally over the top of the pen (individual extension kits can be purchased, two panels per kit, without having to purchase an entire pen). Secure the lid to side panels with large leash clips, so that one panel opens on a hinge, while the other stays in place. To clean the pens, we fold up as many panels as we need to, let bunny out to run around, and vacuum/wipe the floor. Occasionally we need to wash or disinfect the panels themselves. To do this, we either take them outside and hose them down with a brush attachment, or in inclement weather, we wash the bottom half of the pens, folded up, in our laundry tub. You may use any type of flooring you wish, as long as it’s safe for the bunny. Our floors are painted concrete with throw rugs. We also use pieces of pre-cut linoleum, which can be purchased at home centers for a reasonable price. If you want to add a finished look to the piece of linoleum, glue it to a large piece of plywood and finish the edges with framing or edging material, the kind you would find on an office whiteboard. We make the linoleum-covered platform large enough so that the pen sits nicely on top of it. This of course will require some extra time, money, and effort, but is well worth it. If you are on a tight budget with money and/or time, use a material called tileboard as flooring. You can find tileboard in the shower aisle of a large do-it-yourself home center. It’s sometimes used for shower walls instead of tile. Tileboard is usually sold as an 8’ x 4’ x 1/8″sheet of masonite with a thin white coating on one side. Costing just under 10 dollars, it’s less expensive than linoleum, lighter in weight, and easier to maneuver. Inside the pen, make sure the bunny has a place to hide when she wants to be left alone, sleep, or take refuge from the vacuum cleaner. We place a cardboard “hide” box or tube in each pen for this purpose. Safe ramps, pedestals, and multilevel boxes can also be added. If you want to make use of bunny’s former cage, place it inside the pen area. This is bunny’s personal space, where only she is allowed. Place a litterbox in one corner of the pen. I have seen dramatic improvements in litterbox habits when bunny goes from cage to pen. Many people tell me that their caged bunny — even when spayed or neutered — will not use the litterbox inside the cage. Once the bunny has more freedom to move about and “get organized”, he usually wants to keep his toilet area neater. If you really don’t think you have the space for a pen, I highly recommend wire dog crates, no smaller than 3’W x 2’L x 27″H. They come with a hard plastic, easily washable floor, and many are collapsible. This is large enough for a litterbox, some dishes, and space for the bunny to move around. You will not find these in the rabbit section of a pet store. Look in the dog and cat aisles instead. The popular 16″W x 25″L x 15″H cages sold as rabbit housing (see photo) are inappropriate long-term accommodation for any size rabbit. With litterbox, dishes, water, and toys, there isn’t enough room for bunny to even turn around. The top of these cages hinges open, making it dangerous for bunny to hop in and out. I use these units as car carriers. The top comes off, so I also use the plastic bottom as a giant litterbox for larger rabbits or pairs. I call exercise pens the “guilt-free” way to house a bunny. While you are at work or asleep, bunny has the freedom to move around as he pleases. It’s a happy medium between caged housing and free roam. For those of you with free-roaming rabbits, good for you! Many rabbits have been granted free-run privileges, or enjoy free run in combination with minimal time in a pen.